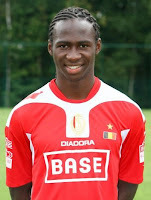 Valencia CF is set to sign Standard Liege central defender Eliaquim Mangala and the deal should be done within 2 days. His price is set to be between 3-4 million euros, but his salary would be very low bellow 1 million. Eliaquim Mangala (born 13 February 1991) is a French professional football player of Congolese descent who currently plays for Belgian club Standard Liège in the Jupiler Pro League. Mangala is a France youth international and is currently playing with the under-21 team having made his debut on 13 November 2009 against Tunisia.